Slideshow Projects - Details | Dreamy Papers - unique new and old papers worth dreaming about! These are details of the projects shown on the slideshow (see sub-tab "PROJECTS: Slideshow" under main navigational tab "Inspirational Papercraft Projects"). You're welcome to use these as inspiration and adapt these ideas to fit your project. However, please don't copy our exact work. Copyrights of the creator/artist apply. Thank you. Enjoy! 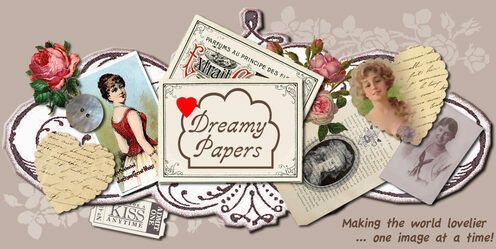 on Etsy - "Dreamy Papers" store. 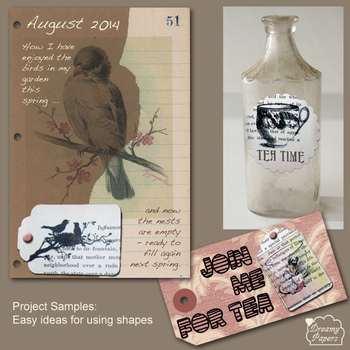 a: A tag shape with birds in nest silhouette - adhered with a decorative brad on a journal page to complete the story. 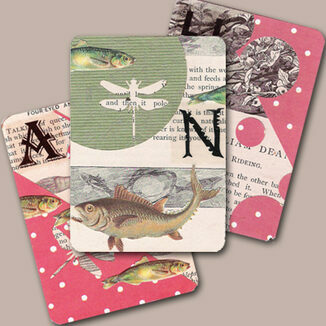 Variations: Attach with glue, or washi tape. Edges: color or distress. Add lettering or other embellishments. Maybe slip the tag inside a clear little pocket made especially for it? b: A teacup image shape attached to an old bottle using glue or gel medium. Variations: Add further embellishments, lettering, color, etc. Decorate the bottle with wire or string/yarn wraps, adding tags, found objects and other embellishments. c: A little mouse + teacup tag shape, attached with a brad to a decorated tag. Variations: Black & white images allow you to use your own colors or distress finish. 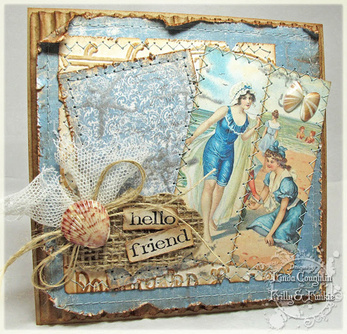 offered on Etsy - "Dreamy Papers" store. 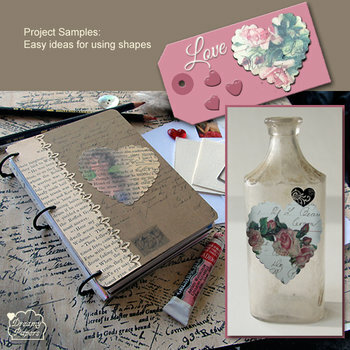 a: A tag shape heart shape, heart shaped embellishments and stamped "Love", embossed. 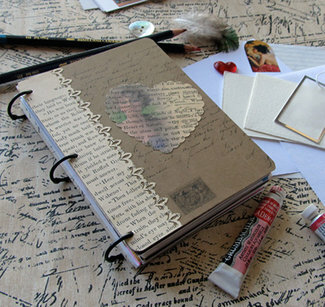 b: An art journal with heart shape used on the cover - see more details immediately below. and add heart charms or tags. The back of this journal is similar. if you can't see one listed. #004-006. ATC/ACEOs art cards (2.5x3.5"). 1800s, as a base on card. are used, and shapes within shapes. Purchased from the Dreamy Papers Etsy online store. Please like & share. Thank you!